Welcome, foolish mortals, to the lonesome library of the Haunted Mansion. In this bone-chilling book, you will read the terrifying tales of the Fearsome Foursome - four kids who try to out-scare each other with frightening fictions of their own. But just wait until they hear my spooky stories. Who am I? I am Amicus Arcane, your librarian and host. Your Ghost Host. So read on... if you dare! As a huge fan of the Haunted Mansion ride at Walt Disney World, I jumped for joy when I discovered there was a whole series of books based around it. I discovered these a couple of years ago and almost picked them up last year when we were in Disney World but decided against it when I found out you could get them in the U.K. on Amazon. I actually received the first three books for Christmas (there is a fourth one coming out this summer too). We have a shelf in our spare room dedicated to The Haunted Mansion as Josh and I love it so much and these book look amazing on the shelf. They're a clothbound/hardback mix and look like they've come straight off the shelves of the Haunted Mansion library. I believe they are soon to be released in paperbook but I feel they just won't look as good. When four kids band together through their love of horror stories they form a strong bond, always trying to find ways to scare each other and tell the spookiest story of them all. One day they get a strange invite to a creepy house and thinking it'll be the perfect location for the scariest night ever, they head off. It's only when they get indoors and meet the mansion's librarian, Amicus Arcane that they release all is not what it seems and Amicus is on a mission to tell the scariest story they've ever heard. 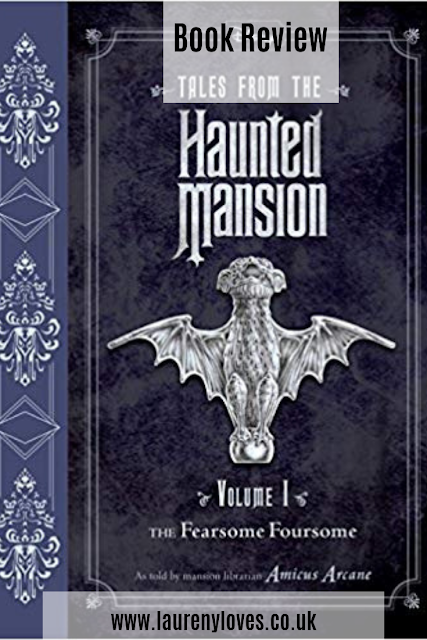 One by one each of the Fearsome Foursome hear a tale from Amicus that involves them and when they release that the mansion actually has no windows or doors, they begin to wonder just how they're going to get out of the Haunted Mansion. 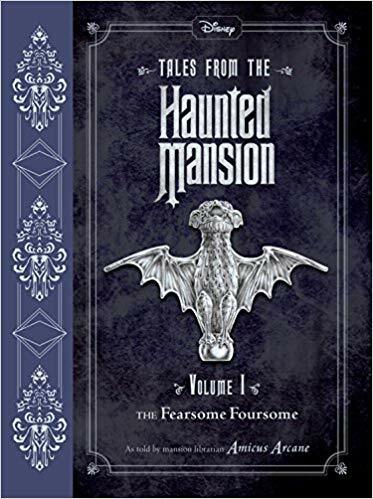 I will say, unless you're a big fan of the Haunted Mansion ride like me, you probably won't enjoy this book. It's not the best written novel ever and it's certainly not scary (if I were to guess an age range for readers i'd say 10-12 but of course any Haunted Mansion fine, regardless of age will enjoy it) but I just loved it for the fact that it's littered with references to the ride and I couldn't help but read Amicus' bits in the voice of the ghost host from the ride! I'm really glad I added these books to my collection, it was a fun read and it looks really good on the shelf so I can't wait to read the other books and add the fourth one to my collection. This reviews star rating takes into account the look of the book and the fact it's about my favourite ride which is why it's scored so high.